Body Solid, the manufacturers of this space saving elliptical trainer are confident in their product such that they give you 15 years frame as well as a ten-year motor warranty on this machine. This is one of the best warranties on an elliptical trainer let alone a “small space elliptical machine”. 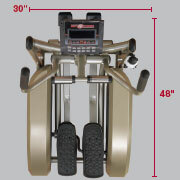 A key feature of this elliptical trainer is the stride length at 21 inches. In my post on the best 3 elliptical trainers for small spaces, I have covered why stride length is important in an elliptical machine. Stride length is described as the distance/longest length between your bent and out-stretched leg. At 21 inches, the Best Fitness E1 elliptical means you can expect to maximize calories burnt while you exercise. 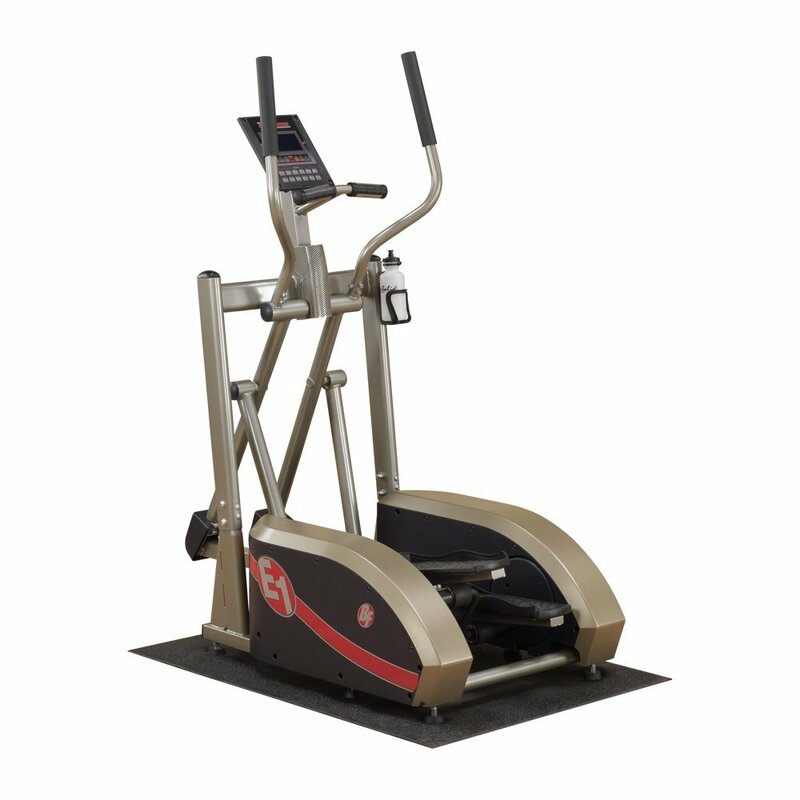 The BFE1 is a gym quality small elliptical for home and is normally priced well above £1000. However as this is one of the best machines, it deserves a review on this site so don’t let the best fitness cost put you off. Actually I have spotted a big discount of up to 43% at the time of writing this post. I am not sure how long this will last so if you want to treat yourself to a best elliptical for small spaces on the market at the moment, be sure to check out the current best fitness e1 elliptical price on Amazon. Click here to get latest pricing discounts on the Best Fitness E1 elliptical. Finding a comfortable small elliptical for home is often a challenge. 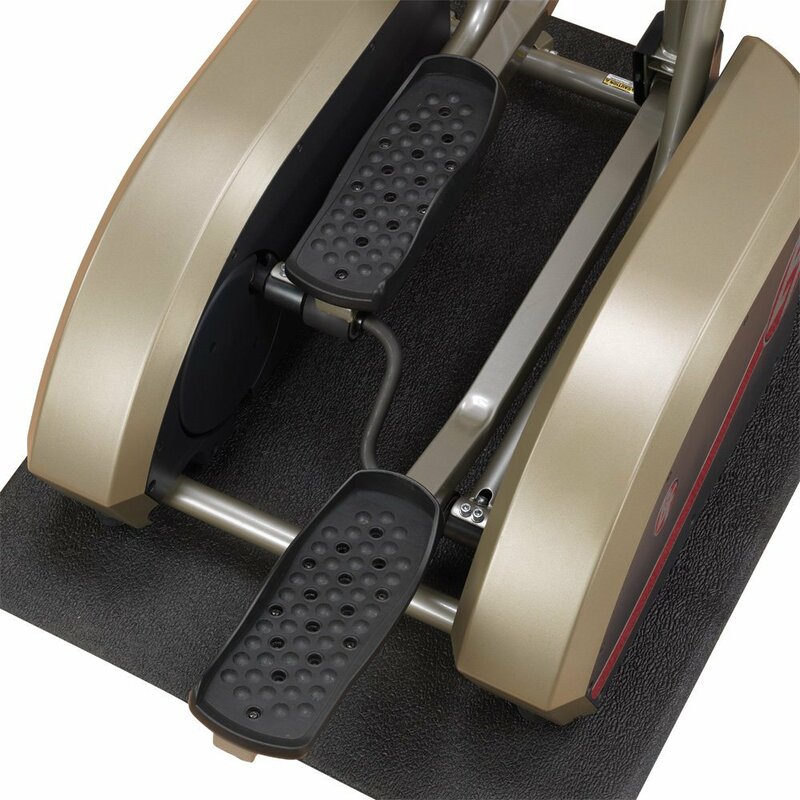 The reason is that as the elliptical machine footprint becomes smaller, performance and quality become increasingly compromised. The Best Fitness E1 elliptical however seems to defy this and is best described as one of the best small elliptical for home characterized by a comfortable and natural stride. 1. Smoothness – The BFE1 uses a center drive system which uses a “Patented technology” unique only to Body Solid Inc. This technology delivers one of the smoothest elliptical training experiences due to bio-mechanically correcting the shape of the ellipse. As you ride the machine the movement does not feel artificial but rather feels as if you are just walking. This reduces fatigue on your joints and knees. You may therefore come across materials which refer to this machine as the “Best Fitness Center Drive Elliptical” due to this comfort feature. 2. Handle Design– achieving a total body (upper and lower body) workout is made possible by the moving arms on this elliptical trainer. This ensures that you maximize your cardio exercise. What I particularly like about the handle design is that it has inbuilt heart rate monitors, eliminating the need to buy a standalone unit. Additionally you also have static handle bars (still with contact heart rate monitors) for when you just want to rest your arms while exercising. 3. Pedal design – to ensure you minimize/decrease fatigue around your hips, Body Solid have placed the pedals close together. However they have done so in such a way that it doesn’t feel cramped but actually delivers a compact elliptical design feel. The pedals are not adjustable, but there is not a huge need for this as they are of good quality and size. 4. 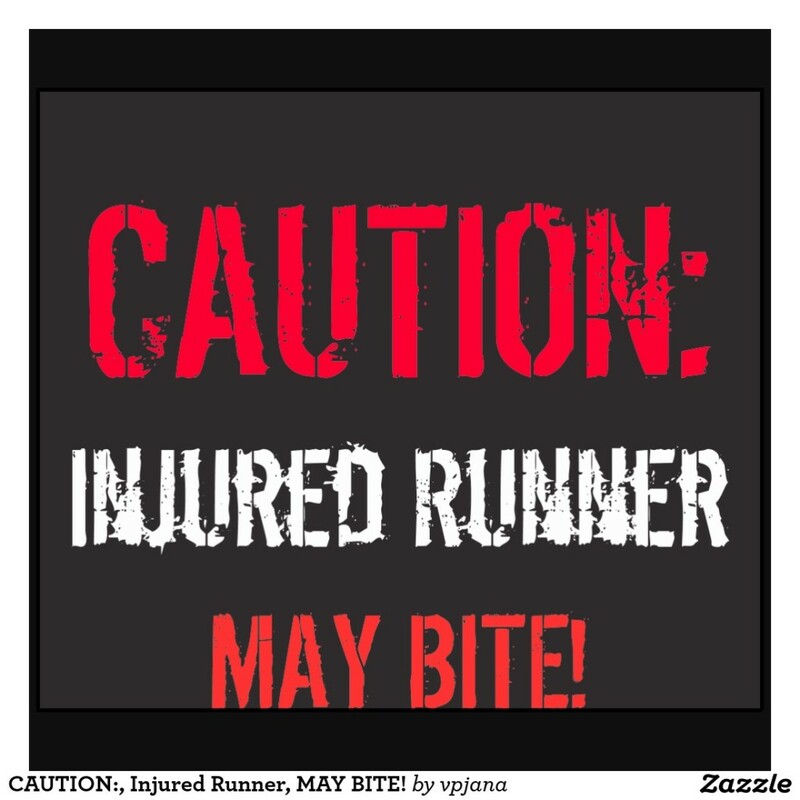 Padded footrests: having a solid non slip feel while you train is a vital comfort feature. The pedals are made of non-skid materials, so you can exercise with peace of mind. 5. 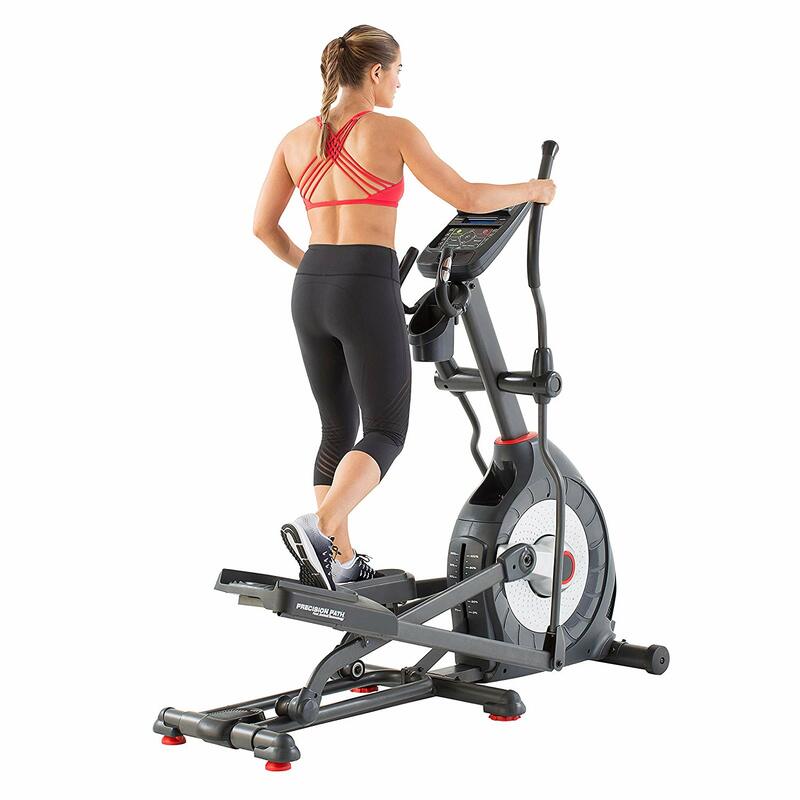 Step-up height – hopping on and off this machine is a breeze, thanks to its step-up height. This has been properly designed with safety of use in mind. You can confidently start and finish your workouts without stretching yourself to either hop on or off the machine. This design is in line with the compact nature of the machine. Space-saving exercise machines normally suffer from one thing, balancing noise levels. If you have a small apartment, any sort of noise can get easily amplified so it´s important to ensure you get a quiet machine. The BFE1 beats most small elliptical trainers when it comes to noise management. Firstly the balanced steel frame eliminates rocking while you train. Rocking is normally a major source of noise in an elliptical trainer and especially so the space-saving ellipticals, as quality is normally compromised in the quest for compactness. Secondly the BFE1 is packed with durable components, which in turn means wear and tear and knocking sounds are not common. Lastly due to an electronically controlled resistance and sealed bearings, the machine is delivers a quiet operation making it truly ideal for small spaces. 1. Workout Programs :- All the workout programs on this compact elliptical trainer are easily accessed at the touch of a button. The Best Fitness E1 elliptical comes with 12 preset workout programs as well as a user mode which allows you to set your own program according to your exercise requirements. The preset programs are clearly designated as P01, P02… up to P12 so its easy to know when you are in this mode. A key feature which most users find useful is the ability to easily switch between modes by the simple use of up/down buttons while in “training mode”. 2. Resistance Levels: This elliptical machine for small spaces has 17 resistance levels. 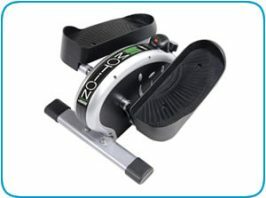 This is higher than other larger footprint though small space machines like the Horizon Fitness EX-59 (see my review here). You can easily set custom levels for resistance. Another versatile feature linked in with resistance levels is how it can either decrease when you pedal quickly or increase when you slow down. This means you will always get the desired workout through your cardio program. 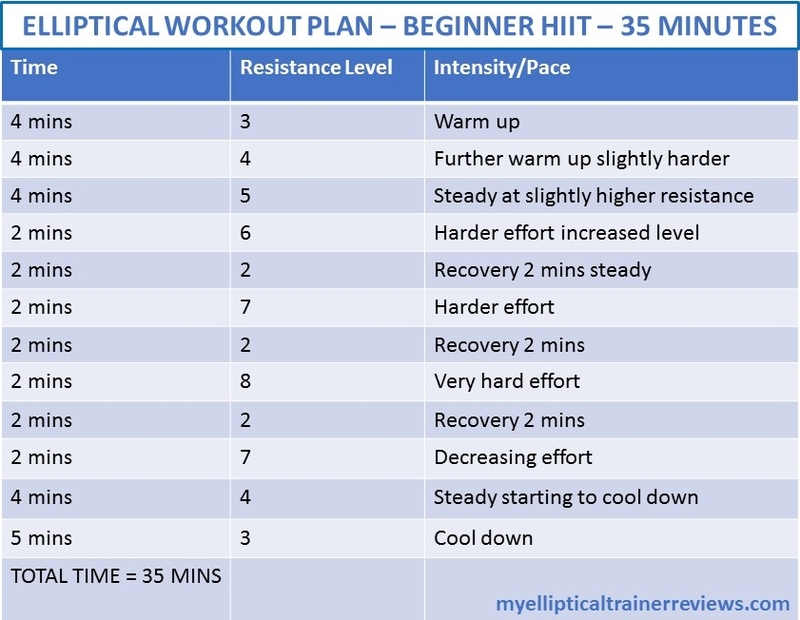 Whatever your level of fitness is from beginner to pro, the 17 levels of resistance provide a good and meaningful challenge for you. 3. LCD Design: There is nothing that irritates me more as failing to read my vitals while I train. This chronic problem exists even in some of the so called best space saving elliptical trainers, being developed by some fly by night manufacturers. I am glad that on the BFE1, you will not experience this problem. This trainer comes with blue back-lit Liquid Crystal Display console. To ensure good contrast, Body Solid has integrated some white letters making reading vitals easy. 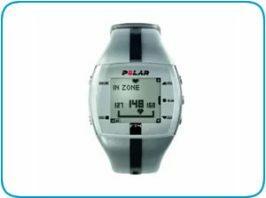 You will get 11 key pieces of information from the LCD including time,speed, calories, distance, pulse etc. 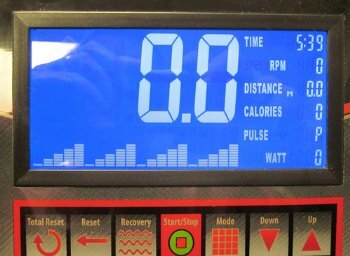 If you leave your machine plugged in when not training, you can even read the time of day on the console. 4. Storage and Transport: When it comes to managing space, having the freedom to move your machine to a place which is convenient cannot be overemphasized. One thing I particularly liked about the Best Fitness E1 when I visited the local sports shop was the ability to push it around making it easy to manage. The BFE1 has some front transport wheels for easy storage. Its compact nature is truly a feature worth every dime you spend on this space saving elliptical trainer. Assembling this space saving elliptical trainer is easy as the instructions are very clear. From the various reviews and chats I did with the salesperson at my local sports shop, it should not take you more than 60-90 minutes. I personally think that if a small elliptical for home takes you more than 120 minutes to put together, then there is something wrong. Even the less techy and unenthusiastic of people would be able to put this together in 2 hrs tops! 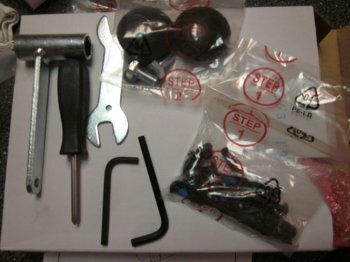 What I like about the Best Fitness E1 elliptical assembly is not only how clearly laid out the directions are in the user manual but you also get all the tools, bolts and bits in a clearly labelled pack (see image). All the user reviews on Amazon (click here to read them) corroborate on how easy it is to put together this space saving elliptical trainer. 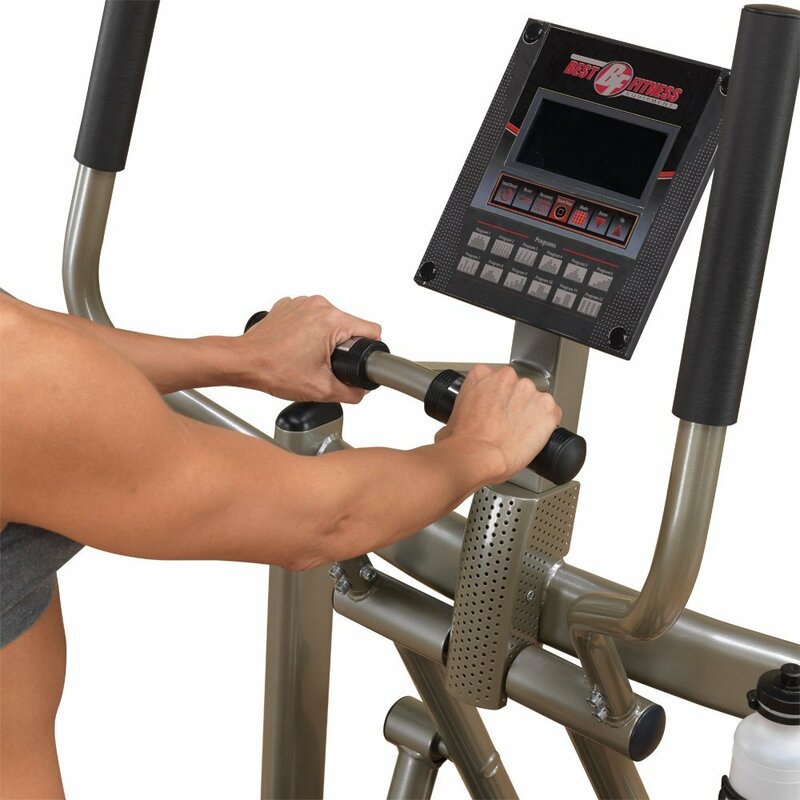 Your new Best Fitness E1 compact elliptical ships in at 215 pounds. At this weight it will probably need two people to move it about as it will be packed in a large carton. Once assembled the recommended weight load is 275 pounds and this is more than your average Joe. Most women would actually find that the BFE1 is ideal for them as it´s rock steady when fully assembled. A key consideration to anyone interested in elliptical machines for small spaces is the footprint. The best fitness E1 footprint is a mere 48’x30′ (LxW). It´s height is 66 inches. 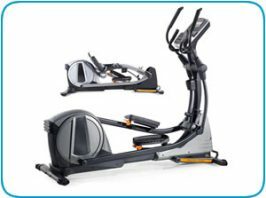 Compare this to the Gazelle Edge Elliptical Trainer which stands at 43″ x 28″ x 53.8″ (LxWxH).